Veinlite LED+ features a new 27mm opening, increasing the area of illumination by 65%. The LED+ is designed for versatility, featuring an increased area of illumination and higher contrast imaging. TransLite LLC, a global leader in the design and manufacture of innovative vein access devices for medical professionals, announces the all-new Veinlite LED+®. Veinlite LED+ features a 27mm opening, increasing the area of illumination by 65%. 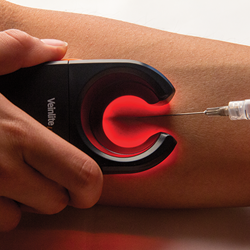 This makes it faster and easier to locate veins and bifurcations, aiding in the identification and selection of suitable veins. Veinlite LED+ also meets INS and CDC Guidelines for infection control, a critical consideration when providing healthcare treatment to any patient. This device is suitable for use on adults and children, and its array of 22 bright orange and 6 deep red LED lights provides optimal contrast for both light and dark skin tones. Orange and red lights can be operated independently or in combination. Veinlite LED+ is available immediately. US customers can purchase direct from the company’s website, veinlite.com (includes an exclusive five-year extended warranty). For customers in other countries and territories, please see Veinlite’s Authorized International Distributors.